US silver coins featured 90% silver content for the vast majority of the nation’s coining history. From the first silver coins issued in 1794 through to the quarters and half dollars of the 1960s, the silver content in US coins remained steady at 90%. In 1964, the US Mint moved away from this higher silver content to save money, lowering the content in all coins to 40% silver instead. Today, 40% Silver Coins are available to you in bags of $100 (USD) totals at Silver.com. 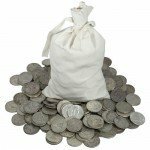 Coins ship inside of a linen bag totaling $100 (USD) in half-dollar coins! Individual coins contain 40% silver! Consists of .3617 Troy ounces of actual silver content. The individual coins have a face value of $.50 (USD) fully backed by the US government. 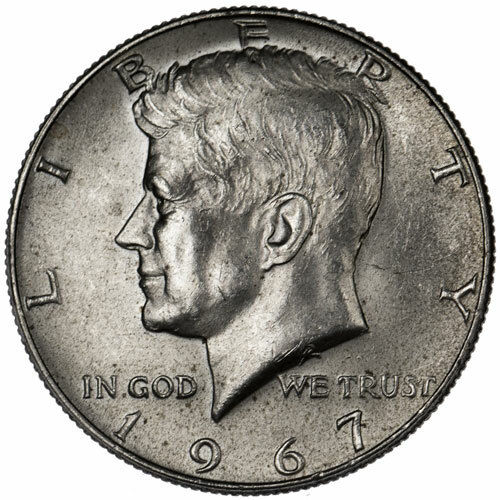 Obverse of the coins features the portrait of John F. Kennedy. Reverse of each coin bears the presidential seal. 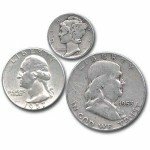 As silver prices starting increasing in the 1960s, the US Mint realized it was getting more expensive to produce circulation coins using 90% silver. The immediate solution to this was to drop the silver content in coins, and starting in 1964 all remaining US silver coins in production were dropped to a silver content of 40%. Although this practice continued throughout the remainder of the decade, it would not last long. In the 1970s, the US Mint began transitioning all silver coins in all denominations to new copper-nickel alloys referred to as cupro-nickel. These coins had greater resistance to wear and tear in circulation. 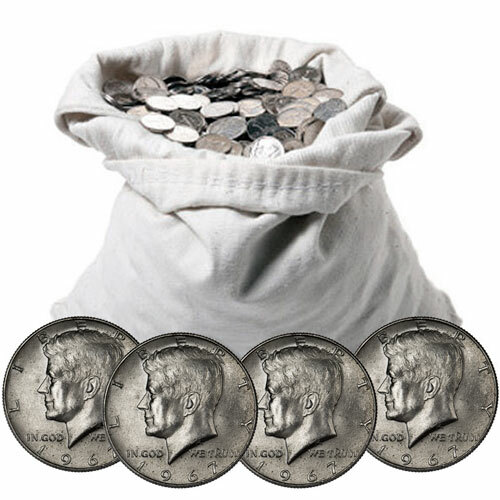 In this Silver.com listing, you’ll receive a linen bag containing a collection US half-dollars with 40% silver content. The production of 40% silver coins lasted from 1964 to 1969 in the half dollar, with a few collectible sets of the same design issued in 1970 as well. After 1970, only collectible US silver coins had a purity level above 40% silver. On the obverse of most half dollars in this listing, you’ll find the portrait of President John F. Kennedy. The nation’s 35th president is captured in a left-profile design created by Gilroy Roberts in 1964 for use on the half dollar. Kennedy’s bust remains on the half dollars today, with most coins issued coming in collectible sets. Please don’t hesitate to contact Silver.com with your questions. You can reach out to us on the phone at 888-989-7223, chat with us live online, or simply send us an email.